Cape Cod Floor plans feature the living and common space on the first floor with bedrooms on the second. This more traditional layout is pretty sought after in contrast to the many reverse floor plan homes throughout Manhattan Beach. When taking a walk on The Strand, it quickly becomes apparent just how popular Mediterranean style homes are in Manhattan Beach. Peeking in popularity during the 1900’s - 1930’s, the style is reminiscent of palaces and villas from the Mediterranean. Wrought iron elements and white stucco walls are just some of the distinctly identifiable elements of these homes. Grand, lush gardens and arched doorways/windows are also strong identifiable components. Although historically, the wrought iron elements and grilles were added for security while windows were left open, today most are decorative elements. 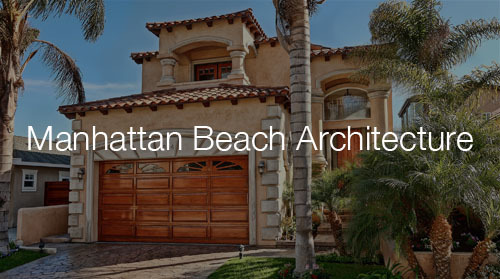 With several Mediterranean homes on the market in Manhattan Beach, finding one that suits your needs will not be difficult. Call it a contemporary style home or modern home, most individuals use the term interchangeably, although there are architectural differences in both. It’s undeniable that in recent years, contemporary homes are being built and essentially “devoured” by the market of buyers that are out there. Current contemporary homes have a huge emphasis on natural light and the marriage of indoor and outdoor space. With the importance and popularity of sustainable and “green” materials, most contemporary homes are extremely energy efficient and built using a lot of recycled and non-toxic materials. Of course it is also important to keep in mind that every builder and architect is different in what materials they choose to use. Contemporary homes also honor a very open and minimalistic floor plan with lots of big open windows and doors.